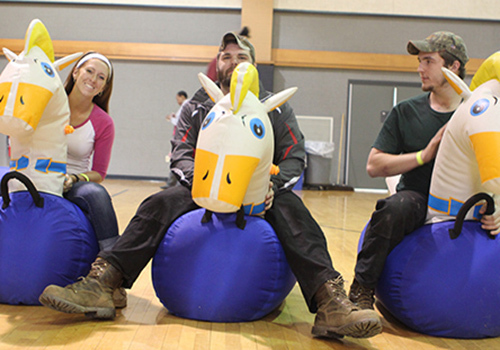 SUNY Cobleskill students participate in a ‘horse race’ at the Grad Fair. The event allowed students to order their graduation regalia, enjoy refreshments and have a little fun in the process. If the road to graduation occasionally seems long and arduous, for students at SUNY Cobleskill, it seems it can also sometimes involve large quantities of whipped cream. Preparations for commencement at the rural New York campus used to be a fairly sober affair, with students readying for the big day with just the administrative process required to collect their caps and gowns. All that changed with this year’s Grad Fair at SUNY Cobleskill which, with a strong a carnival atmosphere, ensured a much more eventful lead up to graduation. 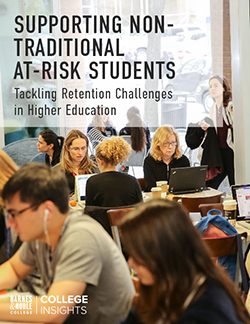 “We have a model here of putting our students first and we know graduation can be a stressful time of the year — that sense of what’s next, of finding a job and leaving friends,” explains Vice President for Student Affairs, Steven Ackerknecht. “The idea of a Grad Fair, where the school could come together in a fun, student centered-way, seemed the perfect way of easing that stress, and a great opportunity to celebrate before our grads leave the campus,” he adds. That sense of celebration began when SUNY Cobleskill Bookstore Manager Jeri Usatch discovered some long forgotten carnival games in storage, and started to think about how to create a more festive air to the graduation proceedings. Working with partners like Stewart’s convenience stores, who provided a plentiful supply of ice cream and toppings for a sundae table, and Coca-Cola, who donated t-shirts, giveaways and beverages, Usatch also brought in a DJ from the university ranks while the campus provided food. A professional photographer was also on hand for portraits and a representative from Barnes & Noble College supplier, Herff Jones, helped students with their graduation regalia needs, from class rings to announcements and diploma frames. 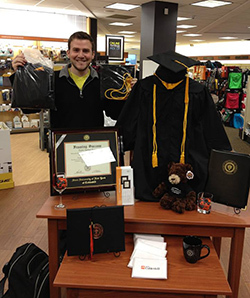 A display in the SUNY Cobleskill Bookstore showcases graduation regalia and gifts for graduates. Vice President for Student Affairs Steven Ackerknecht and Acting President Dr. Debra H. Thatcher present SUNY Cobleskill Bookstore Manager Jeri Usatch with an award for her service to the school. That kind of commitment also underscores the role the bookstore plays at Cobleskill, and her belief that a campus that plays together, stays together. 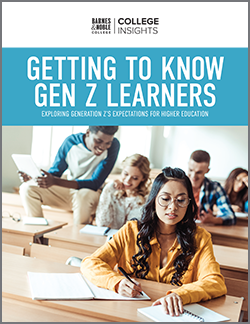 “It’s important if you want a successful store; if you want to support your students and campus, and support great retention — those kinds of things aren’t going to be handed to you,” she maintains. 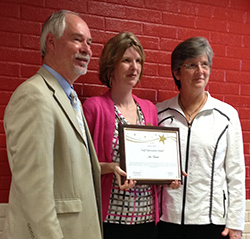 It’s a philosophy reflected in outcomes such as this semester’s highest textbook adoption rate ever, and also in the service award Usatch recently received in recognition of her dedication to the school. “To be able to walk anywhere on campus and have the kids stop and talk with you — I love that; I honestly want for nothing,” she says. And as the Class of 2014 leaves Cobleskill to meet their futures, plans are already in discussion for next year’s Graduation Fair. Somehow, we know it’s going to be the party event of the year.